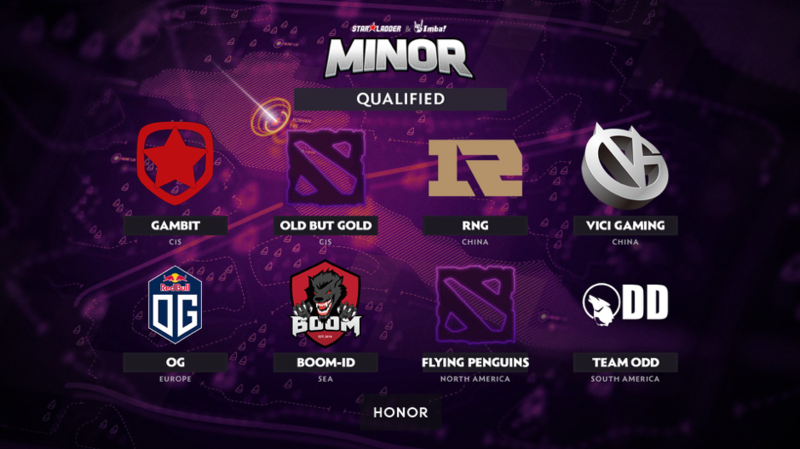 The new approach this season sees Valve sponsored minors only open to teams not participating in the major. It provides a significant monetary reward and Dota Pro circuit points, to a team which may not normally be privy. More importantly, it also acts as a feed into the respective major with the winner taking the last qualifier slot. DreamLeague 11’s feed-in is the Starladder minor. With a prize pool of $300,000 and 500 DPC points on offer, it houses the remaining teams not qualified for DreamLeague. Starladder has been hosting tournaments since 2011, including recently hosting the Chongqing Major along with ImbaTV. While the format of the event has yet to be announced, if it follows the Bucharest Minor, it will be divided into groups and playoffs. Groups will see the 8 teams split in two, playing double elimination best of 3’s with 1st and 2nd taking upper brackets in the playoffs. The playoffs behave the same way as the groups, but instead includes all 8 teams, who start in either the lower or the upper bracket based on their performance in groups. All game being best of 3’s including the finals. All games, no matter if group stage or playoffs, will be played on stage at the Cybersports Arena in Kiev, from the 7th to the 10th of march. The nature of the minor sees strong teams that have missed the major compete against up and coming teams that don’t see much international exposure. This volatility may be amplified by the release of the new patch. 7.21c has just released, bringing with it some much needed changes. While the meta hasn’t stagnated by any means, balancing of in-meta heroes should increase pick diversity. There’s nothing too major in 7.21c, Midas nerfs, the anticipated viper nerd and a further reduction in the experience lost to denies. The release of the patch may cause historical performances to become unreliable. The hungry teams possess an advantage, which may favour the break out teams. Something to note is the current hostility between Russia and the Ukraine were Starladder is held. Russian players might have issues securing visas to compete in the event. Team odd has rebranded to playmaker esports. Gambit is a team that has come from the CIS scene and made a big splash with a great performance in the Weplay Valentine Madness, winning against some strong European teams. They continued their form into ESL One Katowice, finishing 2nd after only dropping a series to Team Secret. While they recently stumbled in Weplays tug of war, exiting in the 1st round against a far weaker team, they’ve looked too good to not have them as favourites. Surprisingly their Midlaner has chosen to play WESG alone, instead fn is set to replace him for the event. As the International champions, OG is currently victim to the TI winners curse, having a mixed bag of mediocre to poor results. They have managed to string together some decent performances after bombing out of the Dreamleague qualifiers and got 2-0ed twice by Gambit at ESL One Katowice after a great run. They recently played in Weplay’s Tug of War, with Liquid’s Kuroky standing in for iLTW, managing to get cleaned up 2-0 by the newly formed Team Singularity in a massive upset. As a team they’re still strong, but relative to the level they used to play at, they’re currently weak. Vici Gaming has always been a big name in the Chinese scene. As a team with experienced players and international results, they’ve gravied away from local events. And while VG gives even the best teams in the world a run for their money, they have had some weak local performances. They failed to qualify for the major, by a large margin I might add. If they perform like they did in Macau against the western teams, they have a real chance of winning. Royals Never Give Up is in a very similar position to VG. Getting floored in the Chinese qualifier for ESL One Mumbai, but then beating VP and Liquid in Macau groups. Results that are very common from Chinese teams due to the horizontal nature of the Chinese scene. They have strong enough players that they should be able to beat the weaker teams in the minor without much trouble. A starladder win is dependent on their preparation and some on the day performances. Old but Gold. A newish Russian team containing some big names. A couple of years ago players like G and Iliidan were considered tier 1 players, playing in the old Virtus.Pro line-up that had great international success. The CIS scene is brutal, and it’s now a tradition to see up and coming teams from CIS dominate before crashing around TI. Whether or not Old but Gold does the same remains to be seen. The team thus far has had mediocre results, not really posting results of worth but you can never really rule them out. Boom ID. They qualified for WESG, coming 4th in the South East Asia qualifiers. Had a strong Starladder qualifier, not dropping a game against teams with big named players, including the likes of Dendi (TI1 winner), Moonmeander (3-time major winner) and Chuan (TI2 winner). While I wouldn’t consider these strong teams in their current form, Boom’s strong showing in their region is impressive. However, their rooster is full of unfamiliar names. They haven’t had an international showing apart from the Bucharest Minor, were they struggled to find a footing, getting 2-0ed twice by a very weak OG. Flying Penguins. Coming through the North American qualifiers to some mediocre competition, the penguins are a team of refugees. Most have played in top NA teams in the past and have formed in the scrappy and volatile nature of tier 3 NA Dota. FP did however manage to take a series off NA giants EG in the Dreamleague qualifiers, showing signs of life. The team cannot be dismissed due to the presence of Eternal Envy and his high-risk play style. Playmaker Esports. A South American team who haven’t really had the opportunity to play in the larger events. SA generally doesn’t get a qualifier for events. While they were present at the last Bucharest Minor, they’ve had issue adapting and couldn’t close out a game. Hopefully this Minor they are more aware of the standard and learn how to play outside their own region a bit better.